I can see protecting horns, but for all other apps, I'm not so sure. Maybe we should drag BB in here? Tweeters will have too long dome movement/excursion at low frequencies. EVERY speaker uses some type of crossover.. if it's multi-way, multi driver... either active (external unit) or passive (components inside the cabinet). It's necessary to bandwidth limit the sound coming from each driver as this is the concept of a multi-way loudspeaker system. Advantage?? it works. Digital (active) vs Passive? that's another story and big one for sure. But here is where the question sets. I know of several designs in upper end audiophile stuff that use acoustic transmission lines that separate the bass from the mid speakers, in which the cabinet design plays more of a role than the crossover. Expensive, yes, but when top end ME guys use $45K speakers, the costs are equivalent. This is the question, restated for clarity. Is the use of transmission line design technology designed into the room a choice (alternative/better/whatever) for mastering purposes? Yes, there are band pass design for subwoofers, and you can have (truly) acoustical low pass filter with it, but you still need electrical high pass filter for bass/midrange driver, to complete crossover. Otherwise you will have higher THD in LF range because bass/midrange driver contribution. 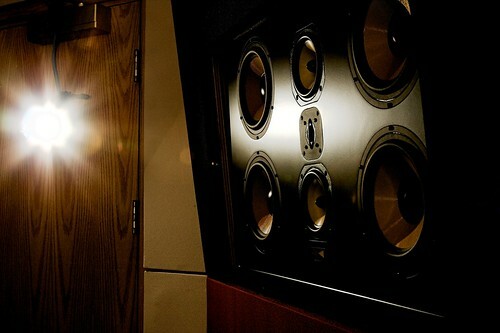 Glen Meadows soffits speaker mastering room, is renowned for it’s clarity and accuracy, at least Bob Katz thinks so.. So, free standing is the norm, yeah, but, when done right, soffits have their beauty. Not here to argue about soffit vs floorstanding speakers, just wanted to bring notice to Glenn Meadows' set-up. I am actually glad you did the same. To lessen confusion and to clarify my original post, I have come to realize that this room was his old room in the Masterfonics studio. His newer room is located in Mayfield Mastering. Both Glenn Meadows' new and old room just appear to similar, which originally made me think the soffits were removed, when in fact the room pictures are from two separate locations. This thread has been super informative. Thanks all! I come from the art meets computer world. It has always been that we can only see less than 8 bits of grey. That is less than 255 grey levels, and we perceive motion as 28-30 frames in a second. We can only here between 20-20,000 wave cycles and frequencies per second. So there is a threshold where it is in distinguishable. I am more of a musician, and I do use all tube amps, so I do not know if the A/D sound hardware is there yet, but I see Terabytes of data processed by CPU's or a gang of them in a mere moment. So if your equipment can sample and turn the analog signal into a digital one at a rate faster than we can perceive and into extreme bits like maybe 16 or greater. That is 65,545 different frequencies, and frequencies by its very nature already has the time component in it (per second)You would never know the difference except how you handle the signal with your "pipes." Additionally all electric digital signals are analog. Unless you are using fiber optic at some point those ones a zeros have to be transmitted through a wire. That is analog. the receiver will know what to do with it based on its protocol, but all your wires are analog. I hope this helps ease your mind. Just buy the very best. Also, maybe you need all the work done by a terminal server and not a little Mac desktop or anything. From another point of view the wall mounted speakers will remove edge diffraction errors. Passive crossovers will add to the circuit and change the amount of dampening the amplifiers can apply to the speaker. Having a true three way or four way active with amplifiers connected to the speakers will provide a lower distorted sound. The added control of the amplifier dampening factor will control the base signals and the punch. bang for the buck. Digital adds the ability to add larger delays that may be needed for Subs, A single sub on center would be advisable but Dual subs close to the speakers can work. Sub off the center adds error because the delay can not be worked for the left and right accurately.